Wadia S7i review | What Hi-Fi? Fourteen thousand pounds on a CD player? Is any CD player – or any piece of hi-fi, for that matter – really worth that kind of money? That’s for the individual to decide (and largely depends on how much you have to spend). But believe it or not, that huge price comes in at the lower end of the scale as far as truly cutting-edge disc-spinners go. It’s possible to spend double or even triple this amount. So, what do you get for the money? A lot. This is a truly massive player. It weighs 25kg (as much as a typical high-end power amp) and, as you’d expect, is built to the highest standards. That casework doesn’t follow the norm by using a chassis made of thin, bent metal fronted by a thick metal facia, either. No, Wadia, as it has done for years, uses thick slabs of metal for all the sides, held together with a large number of very long Allen bolts and a quartet of rounded corner posts. Take the lid off and it’s impossible not to be impressed. The power supply is as chunky as we’ve seen, and the neat circuitry is shot through with quality. 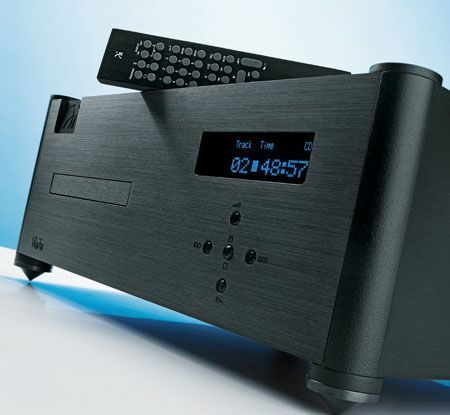 The S7i is more than just a CD player, too, thanks to its range of digital inputs. There’s a choice of USB, optical, BNC and AES/EBU, and all accept signals up to a resolution of 24-bit/96kHz. The S7i also features an on-board digital preamp, so can connect directly to a power amplifier through either a balanced XLR or standard RCA connection. In fact, this is Wadia’s preferred configuration as it shortens the signal path and bypasses the preamp’s circuitry altogether. Once everything’s up and running (the S7i takes a fair amount of time to warm up) it’s pretty much all good news – once you get past the slow-to-respond control software. Many high-end products take some time to run-in before they start to truly impress; it’s over days and weeks of listening that their true capabilities become clear. The S7i isn’t like that. It sounds massively capable from the off. With CDs as varied as Okkervil River’s I Am Very Far to Bill Evans’ Everybody Digs Bill Evans, it delivers a magnificently detailed sound that captures the acoustic textures of instruments as well as we’ve ever heard. More than that, the S7i’s incredible sonic stability really strikes a chord. It doesn’t matter how complex or dynamically demanding the music gets, it’s all kept under control, with every instrumental strand in place. Only the very best equipment manages to achieve this feat so convincingly. This player’s star turn is its bass performance: it’s powerful, rich and articulate. Rarely do we come across low frequencies that combine delicacy and authority so effectively. Wadia has always designed its players to time well, and the S7i is no different. It doesn’t emphasise the rhythmic aspect of music as some rivals do. Instead, it organises instruments in a way in which their relationships are clearly maintained and understood. Put simply, it makes music – all types of music – make sense. Switch to the digital inputs and the S7i continues to impress. It delivers good results playing music from our MacBook via USB, demonstrating an impressive degree of authority and insight. But it’s when we feed a Linn Akurate DS media streamer’s digital output into the BNC input of the S7i that sparks fly. Playing a 24-bit/96kHz version of Shostakovich’s Symphony No.11 by the Royal Scottish National Orchestra, we’re wowed by the amazing sense of space and scale. Dynamics are subtle and wide-ranging, going from loud to quiet in as fluid a manner as we’ve heard from a digital source. The presentation lacks absolutely nothing when it comes to authority and power. The only shame is that the S7i can’t cope with high-resolution 24-bit/192kHz files. While the choice of recordings with this resolution might not be particularly wide, we can’t help but think any person spending this kind of money would appreciate the option. The Wadia is a fabulous product. When it comes to CD replay it’s right up there with the very best we’ve heard, and replay through its digital inputs is almost as impressive, too. If you want the very best – and have the cash – the S7i is a great place to start.